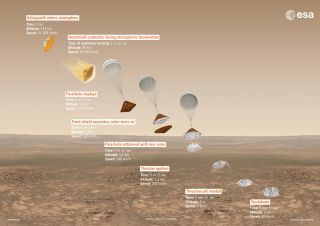 This graphic provides an overview of Schiaparelli's planned Oct. 19, 2016, entry, descent and landing sequence on Mars, with the approximate time, altitude and speed of key events indicated. Europe is on track to achieve an epic Mars landing on Wednesday (Oct. 19) — that is, as long as its spacecraft can survive supersonic speeds, iron-melting heat and a tightly choreographed set of final maneuvers. The lander has a short life span — its battery will die after just a few days on Mars — but the effects of a successful touchdown will be far-reaching. Though Schiaparelli will conduct a bit of science on its own, it is primarily meant to demonstrate technology for an ambitious life-hunting ExoMars rover that's slated to launch in 2020. Schiaparelli launched into space attached to the Trace Gas Orbiter (TGO) on March 14 from the Baikonur Cosmodrome in Kazakhstan and spent seven months traveling more than 300 million miles (480 million km) to Mars. In preparation for landing, the capsule successfully detached from its mother ship Sunday (Oct. 16) at 10:42 a.m. EDT (14:42 GMT). While the TGO gets ready to enter orbit around Mars, Schiaparelli is hibernating to save battery. The lander will be jolted awake only an hour before touchdown, at an altitude of 76 miles (122.5 km), while traveling about 13,050 mph (21,000 km/h). The time span from atmospheric entry to landing is only about 6 minutes. And according to ESA, they will be a harrowing 6 minutes, reminiscent of the "7 minutes of terror" NASA officials cited when describing the dramatic landing of the Curiosity rover on Mars in August 2012. With its aeroshell, Schiaparelli looks almost like a golden flying saucer, measuring 7.8 feet (2.4 meters) across at its widest and 5.9 feet (1.8 m) high. (Without its aeroshell, the surface platform is only about 5.5 feet, or 1.7 m, in diameter.) This sleek protective coating will not only shield Schiaparelli from temperatures up to 3,100 degrees Fahrenheit (1,700 degrees Celsius) but also protect it from the erosion caused by tiny dust particles in the Martian atmosphere. This was a special consideration, given that ExoMars is landing in the middle of dust-storm season on Mars. Once the spacecraft gets within about 6.8 miles (10.9 km) above the Martian surface and slows to about 1,025 mph (1,650 km/h) — still faster than the speed of sound — Schiaparelli will deploy a 39-foot-wide (12 m) parachute. The parachute is tucked away in a "pyrotechnic activated mortar," which, as the name suggests, is triggered by an explosive charge that deploys the parachute at supersonic speed in less than a second to avoid getting tangled with the spacecraft, according to ESA. Another 40 seconds later, Schiaparelli will shed its front shield. And after the capsule slows to a speed of about 155 mph (250 km/h), the back half of the aeroshell — the part that has the parachute attached to it — will be tossed off, leaving the surface platform to land on its own. That's when Schiaparelli's three hydrazine thrusters will kick in to control the lander's speed as its radar monitors its altitude. Then, at 6.5 feet (2 m) feet above the Martian surface, Schiaparelli will hover before cutting its thrusters and plopping down on the Red Planet. Schiaparelli has a small onboard camera to take 15 black-and-white images during the descent, but it won't get an up-close look at the Martian surface; its closest shot is scheduled for an altitude of just under 1 mile (1.5 km). You can follow all of the ExoMars 2016 arrival and landing events via ESA's Livestream page. You can see all of the events here on Space.com ,courtesy of ESA.